Dry skin results from skin’s inability to hold on to moisturising ingredients—in other words, it can’t (for any number of reasons) replenish itself. Skin can be naturally dry, meaning it’s low on substances that keep it feeling smooth and soft, or can become dry for other reasons: using soap, irritants in your products, allergies, dry air, or other environmental factors. While some dry skin problems require a dermatologist’s care, this quick checklist will help you avoid the common mistakes that keep dry skin coming back. 1. Problem: Unprotected Sun Exposure. Broad-spectrum sun protection is imperative to keep skin smooth, soft, and even-textured, and to keep skin’s natural moisture barrier intact. Sun protection should be part of every person’s year-round daily routine. Solution: Paula’s Choice Skincare has formulated several sunscreens for dry skin; each contains anti-ageing ingredients along with calming and soothing ingredients gentle enough even for skin prone to eczema. 2. Problem: Ageing. While there’s no cause-and-effect relationship between dry skin and wrinkles, it’s common for skin to become drier as we age, which can exaggerate these telltale signs of ageing. Solution: Most of us need more than a moisturiser to keep dry skin hydrated, smooth, plump, and even-textured as we age. Luckily, years of research have proven that certain skincare ingredients have the ability to combat the appearance of fine lines and wrinkles; superstars like ceramides, hyaluronic acid, and omega fatty acids can hydrate skin and help prevent moisture loss—two benefits that’ll result in smoother, firmer, plumper skin. Look to products labeled boosters and serums for higher concentrations of such ingredients—you can pair them with your moisturiser for faster results. 3. Problem: Fragrances (Including Essential Oils). Yes, essential oils are natural, and, yes, they smell good; but they’ve been proven to be irritating and drying for your skin. Solution: Dry skin will fare better if you avoid all fragranced skincare products, whether their scents are natural or synthetic. If you’re interested in using only the best natural ingredients to help dry skin, many non-fragrant plant oils and plant butters can work wonders. You can also amp up the nourishing and protecting elements your skin naturally contains (we call them skin-replenishing ingredients) by using products enriched with moisture-binding ceramides, hyaluronic acid, glycerine, cholesterol, and omega fatty acids. 4. Problem: Dry air. If the air is too dry—whether hot or cold, indoors or outside—that low-humidity dryness can degrade skin’s protective surface and leach moisture from your skin. 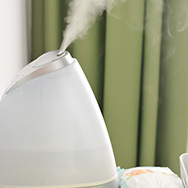 Solution: Purchase a humidifier; even an inexpensive one is fine. It’s even better to place two or three throughout your home. But at the very least, keep one running in your bedroom overnight. 5. Problem: Allergies. Seasonal and/or food allergies can cause dry skin, and often leave it reddened, sensitive, and irritated. Solution: See a doctor; this is something even the best skincare products can’t fully remedy on their own. But, as a rule, be sure you’re using soothing, fragrance-free, and irritant-free formulas that are gentle enough even for skin prone to rosacea. 6. Problem: Bar Soap. Your soap may be one of the causes of dry skin all over your body. The ingredients used to help soap hold its shape leave a filmy residue that sensitises skin and worsens dryness. Solution: Switch to a gentle, fragrance-free facial cleanser, in whatever texture you prefer: liquid, lotion, gel, cream, or oil. Be sure your body wash is gentle, moisturising, and soap-free. Hard water can cause dry skin, too; if that’s a concern, look into installing a water softener in your shower. 7. Problem: Abrasive Scrubs. Wondering what causes dry skin patches? Scrubs are a common culprit. When skin is dry and flaky, a common instinct is to scrub it off. Unfortunately, most face and body scrubs do more harm than good—some can actually damage skin by causing tiny tears in its surface, which increase its irritated, dry, reddened appearance. Solution: a well-formulated alpha hydroxy acid (AHA) exfoliant will gently, and imperceptibly, help skin slough its dead surface layers. And, as a second benefit, AHAs have also been proven to increase skin’s ability to hold on to vital hydration. Solution: Smart skincare requires checking product ingredient lists. It’s common to see irritants like denatured alcohol, menthol (and the essential oils mentioned above) in skincare products—including those that are “all natural.” Natural doesn’t necessarily mean non-irritating, so get to know the skincare ingredients most likely to cause a sensitised response; they can make dry skin worse.